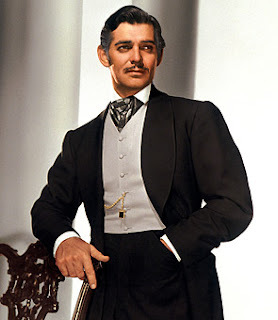 Story of the Old South "Gone With The Wind" Rhett Butler, as portrayed by Clark Gable, "The Rescue from Atlanta." Incredible sculpting and intricate face paint capture the suave essence of the character Rhett Butler in the legendary film Gone With the Wind. Doll cannot hold hat as shown. How can we forget the man? This is just my personal view on it. The sculpt is superb!! Undeniably Gable. Although the gloss on the lips (on extreme close up is something inevitable). 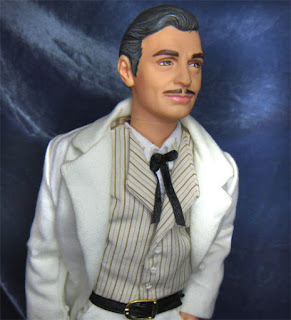 Every inch of this 11 1/2 figure is Rhett Butler. I like the balance of salt and pepper color on the hair. The suit has wonderful details: collar print, the tie, the stripes on the vest, and the dress shirt (long sleeves all the way), lined suit, the belt and even "square-toed" boots, pockets on the pants, the striped vest -- all of this make this a Clark Gable collector's dream! I think no manufacturer of GWTW dolls has captured this likeness -- not only in features but also in character. There is a smirk there that can be teasing on his Scarlett, there is the broad shoulders too. 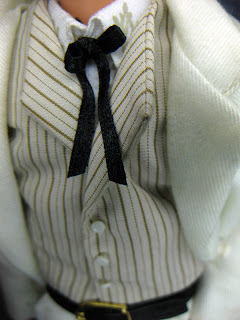 The doll is articulated at the elbows that allows you to put the Butler "hand-in-pocket" pose. Some wishes though. They should made him a little taller than their Scarlett -- at least one head higher. And the suit should have been a more snug. However, Mattel did well on this last in the series of their Timeless Treasures GWTW. Frankly my dear, I did give a damn! If Mattel can get such an accurate sculpt at this size, why is it so difficult for Tonner? That is the same thing on my mind, Dave. If they simply based it on that, I think it would have been easier. I keep wishing they would give their fellows real hair though...!